For years I have been buying pistachios at Tularosa, New Mexico, but it is only recently that I have ventured to the actual farms between Tularosa and Alamogordo to buy directly from the source. 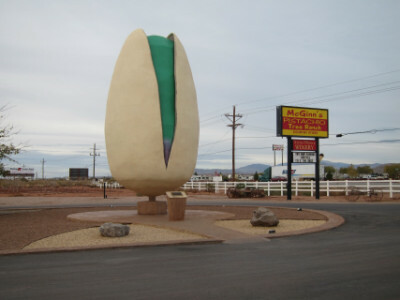 In fact, the clerk in Tularosa specifically directed me to McGinn’s, saying that she liked the different flavors of pistachios they offered. 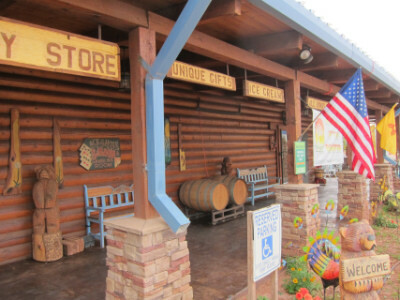 The McGinn’s store is located on their large pistachio farm, and is a large repository for all kinds of New Mexico products (particularly food products). They sell their own pistachios in bags that range from 5 to 20 pounds, but also offer them in flavors which can be sampled at the store (I decided to buy the plain ones). I also had a sample of McGinn’s own salsa brand called Pistachio Tree Ranch (the sample was Black Bean & Corn which was not spicy but had a good flavor). The McGinn operation also includes a winery and tours of the farm (presumably with wine tasting). I thought the prices in the store were a little high, but I was so impressed with having so many items in one place that I still managed to get quite a collection of eats (particularly the salsas). 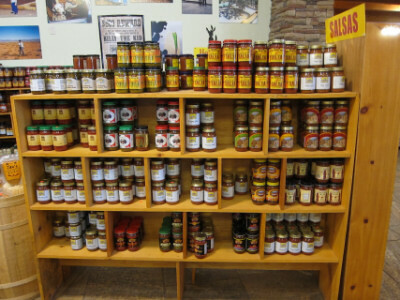 The only place I have seen this big of a variety of New Mexico salsas was in a grocery store in Las Cruces a few years back, and McGinn’s had ones I had not seen before. Because of my previous experience I knew a few I wanted to try and some I did not want to try. By trying the sample at the counter the cashier had an idea about my tastes and what I would like. 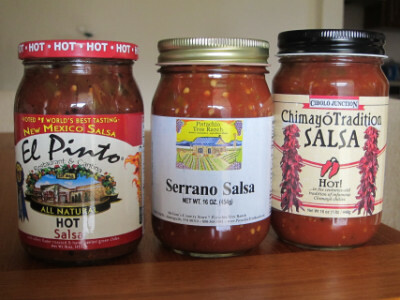 Through this process I started with picking out six salsas from the shelves, out of which the cashier recommended these three (shown below). So far I have tried the Chimayo Tradition Hot Salsa, and so far I think this is my favorite of the New Mexico salsas I have tried. The salsa is fairly simple with chunks of green chile and jalapenos, but the green chiles are the predominant flavor. The base is tomato with lime juice, garlic, and some other ingredients that I think has a very smooth flavor (also notice that out of the three jars this is the one that has the least number of seeds). As I try the other salsas I will update this article. Of course I also think the pistachios grown here are some of the best. Apparently they are available other places in Alamogordo at cheaper prices, but I have not located the other places so I could price them. I could no longer find them at the store in Tularosa that used to sell them (but this is how I ended up at McGinn’s store and was able to find their great selection of salsas). I think the people at Clines Corners have a sense of humor. The “town” consists of one building (the travel center/ gas station) with an address of 1 Yacht Club Drive (you would try in vain to find the Yacht Club here). 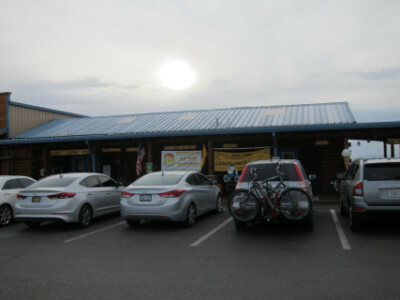 One of the attractions of Clines Corners is that it is so isolated, yet being on the old Route 66 and now Interstate 40 it never lacks customers at its one-stop gas station and travel center (which is open 24 hours). 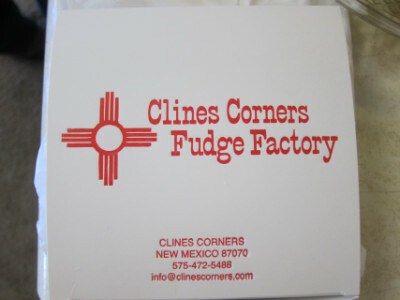 The fudge factory is one of the more popular attractions at the Travel Center, selling its own brand of fudge for a devoted clientele (including my cousins who brought me a sample of the Clines Corners candy). The candy here is travel worthy, apparently being well able to withstand high temperatures and long distances without melting or losing its original flavor. 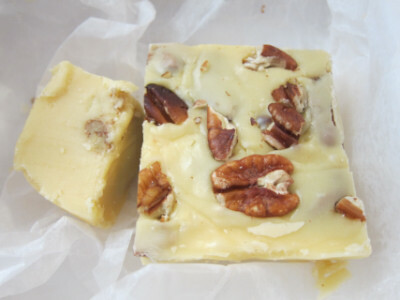 My idea of fudge did not include Butter Pecan, but I am always surprised what I can learn about food. This is a very rich candy that has the consistency of fudge but with the flavor of butter. For me it brought back memories of when I was in Wisconsin and first encountered the local butter which looked good enough that you could cut off a piece and eat it like a piece of cheese (and it was that good). The difference with the “fudge” version, of course, is that it is sweet and made for you to eat it as it is. In any case, I was not only pleasantly surprised by the butter pecan, but I hope to try the regular fudge as well. Probably the biggest factor that makes Cook’s Restaurant popular is the fact that it is open from 6:00 A.M. to 10:00 P.M. daily (and open 24 hours Thursday night through Saturday night-Sunday morning). 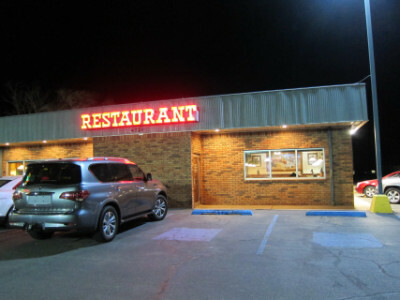 This is a diner and truck stop located about halfway between Clovis and Texico, New Mexico, but is close enough to Clovis to be considered one of the city’s local hangouts. When I entered the restaurant somewhat close to 10:00 P.M. (on a day they were open 24 hours) one side of the restaurant was filled almost to capacity (the other side is presumably open when they are even more busy such as at breakfast time). I did not make note of whether breakfast is only served during certain hours, but it seemed to be a large part of the food served here. In talking to the employees they indicated that some of the breakfast dishes were quite popular. I also noted that over half of the late night crowd appeared to be eating Mexican food, so I naturally assumed this was one of the most popular items on the menu. They do have a large menu of American diner-style items, so I think there is something for everybody here. 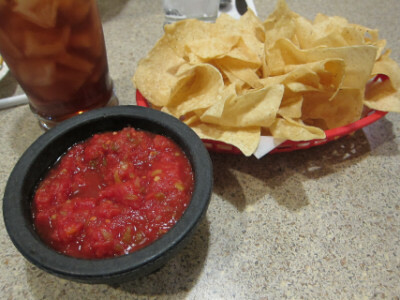 Having decided to order one of the Mexican dinners, I was given some chips and salsa which turned out to be excellent. The salsa was not on the spicy side but had a robust flavor that I would call New Mexican style (the chiles were fresh and seemed to be sourced from somewhere nearby). I do not remember the entire Mexican food menu, but the best options seemed to be a choice between red enchiladas or green. I chose the Red Enchiladas which were served with beans and rice (they said the green was not spicy). I noted on the menu that the dish came with “Red Chili” (the Americanized spelling of “chile”) so this was somewhat of a red flag, but is really the standard spelling I have seen in eastern New Mexico. I really have mixed feelings about this dish because it was certainly not the best example of New Mexican food I have had, but it was New Mexican food nonetheless. The waitress said it was New Mexican red chile, and this was borne out when I tasted it. While New Mexican style enchiladas have either a red or green chile sauce, though, this was more of a gravy that was thick as if they put a filler in it. 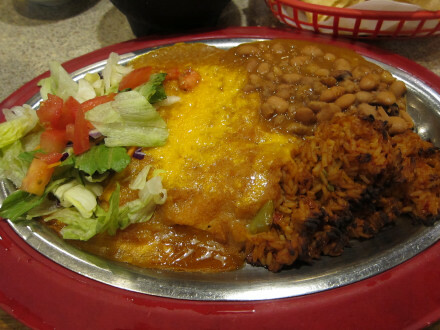 I have seen this style of New Mexican food before, most notably in Tucumcari, but it is a style of food I do not find very satisfying. There was enough chile “bite” in the dish, but I did not find the flavor to be very good. The beans were good, but the rice was burned along the edge (about half of it was edible). There was really nothing else open at that hour and I was glad to get a meal. Enough of it was good that I enjoyed the food (particularly the chips and salsa). For New Mexican food, though, I had a better experience at Leal’s (located a couple of miles west on the same highway but not open as late in the evening).